TradeStation Global has low trading fees. You will get access to many products and in many regions. It also has a fast and relevant customer support. TradeStation Global deposit and withdrawal can be improved. It is not user-friendly and you can use only bank transfer. The account opening is complicated and there is a $5,000 minimum account balance. The available web trading platform is not advanced. We compare Tradestation Global fees with its peers, DEGIRO and Saxo Bank. TradeStation Global trading fees are competitive for all asset classes except the mutual funds. As TradeStation Global is introducing broker of Interactive Brokers, it offers IB fees plus a small markup. It is great. TradeStation Global has very competitive stock trading fees. Only Degiro can compete with them. TradeStation Global fee conditions are mostly a percentage of the traded volume. For US and Canadian stocks it is per traded number of shares. TradeStation Global's forex fees are competitive. It is much less than Saxo. DEGIRO does not offer forex. The forex commissions are calculated as the 0.006% of the traded volume. In addition, there is a minimum of $2 per trade. The European mutual fund fees are competitive. On the other hand, US mutual funds have a high minimum fee. Saxo Bank does not provide mutual funds. European fund fees are calculated as the 0.12% of the traded volume. The US mutual funds have a $25 minimum per trade. It is very high. TradeStation Global bond fees are competitive. DEGIRO bond fees can only compete with them. US bond fees are calculated as the 0.003%, while European bond fees are calculated as the 0.15% of the traded volume. TradeStation Global's options fees are competitive. They are more competitive than Saxo and lag a bit behind DEGIRO. The options fees are volume based, i.e. the number of contracts. E.g. US options have a $1.5 per contract fee. TradeStation Global's futures fees are competitive. They are almost the same as DEGIRO's, but much better than Saxo's futures fees. Similarly to the options, the futures fees are volume based, i.e. the number of contracts. E.g. US futures have a $1.75 per contract fee. TradeStation Global CFD fees are very competitive. We compared the commissions of stock CFDs. The stock CFD fees are calculated as a percentage of the traded volume, except for the US and Canada, where you are charged based on the number of shares traded. If you want to trade on leverage and prefer to hold your positions long, financing costs can be significant. TradeStation Global has an ok non-trading fee structure. As a plus, there are no deposit fees. But, there are inactivity and withdrawal fees. TradeStation Global as its name suggests is a global broker. It serves residents from ~200 countries. This includes all European countries and major non-European countries. There are some notable exceptions, they don't serve US, Canada, Australia, and Hong Kong residents. 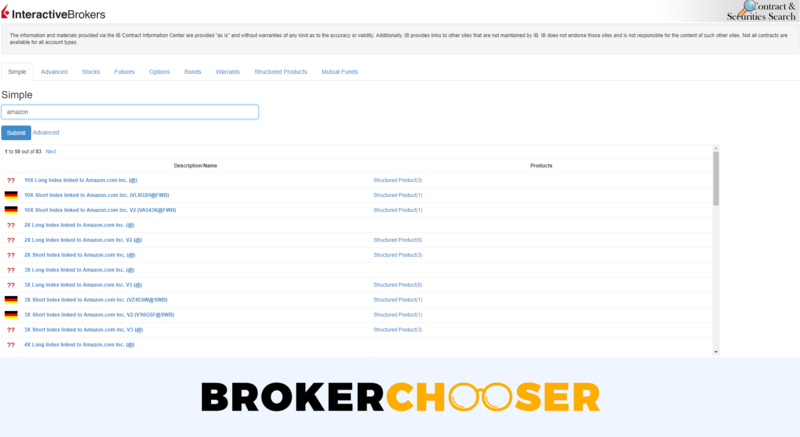 To check if your country is available, use the broker finder tool. There is a $5,000 minimum deposit. It is one of the highest among the reviewed brokers. You can choose from many account types, including individual and corporate accounts. You will also see IRA, UGMA/UTA as account type options. This is pretty redundant, as US customers cannot open an account and non-US clients cannot have an IRA account. Quite confusing. The account opening is fully online but overly complicated. For regulatory reasons, US brokers cannot open your account instantly. TradeStation's account opening is one of the fastest among US brokers. It usually takes 1-2 business days from registration to the account approval. TradeStation Global is operated by Interactive Brokers. So, once you make the first step on TradeStation Global's page, you are redirected to Interactive Brokers. If you did not know this, you would be wondering what you are doing on Interactive Broker's page right after. This is because TradeStation Global acts as an "intoruducing broker", think like an agent. 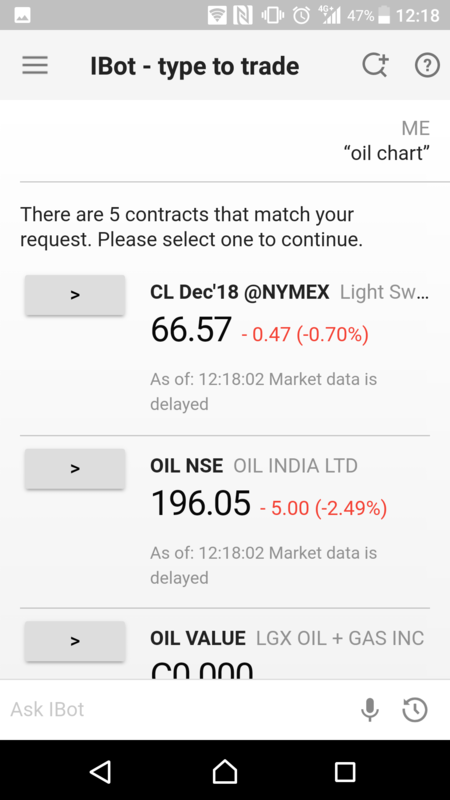 When you open an account you will have an Interactive Broker's account, and your funds will be with Interactive Brokers. At first, you have to go through a 5-step registration process which takes roughly 30 minutes. We felt lost. It was complicated with confusing and unclear messages. Verify your identity with passport / ID / driver's license. Verify your residency with a bank statement / utility bill / driver's license / credit card statement / other documents. 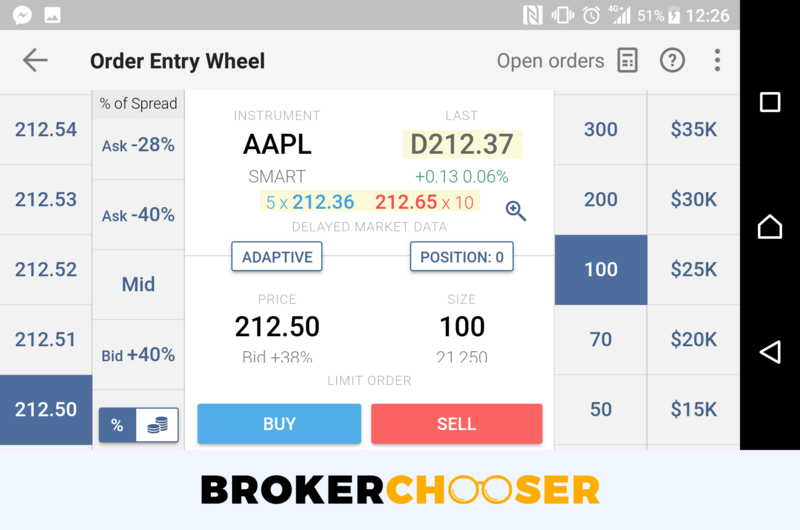 After the registration, you can use Interactive Brokers platform. After you deposit $5,000 you can get TradeStation's platform credentials too. We think it would be better if you could test the TradeStation platform before the minimum deposit. 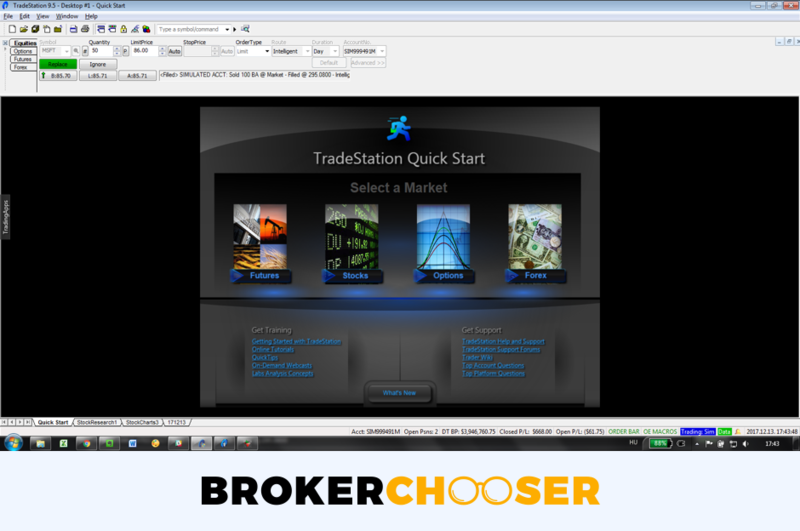 Interactive Broker customers can switch to TradeStation Global and access the TradeStation platform. All you need to do is select "Enable my IB account" instead of "Create an account". TradeStation Global offers its account base currencies, deposit and withdrawal through Interactive Brokers' Account Management site. This means you will only find the relevant information on Interactive Brokers' website. TradeStation Global accounts offer 21 base currencies. This is really wide if you compare it with DEGIRO's 9 base currencies. Only Saxo Bank can compete with its 32 base currency. TradeStation Global deposit is free of charge. However, deposit options are limited, as you can use only bank transfer. It is similar to DEGIRO and Saxo Bank. It is not user-friendly. First, you have to submit a request at Account Management. After, you have to do the transaction through your bank. It would be better if the whole process was integrated into Account Management. Bank transfer can take 2-3 business days to arrive. We tested it and it took 2 business days. TradeStation Global applies withdrawal fee if it is more than one per month. The first one is free per month. After that withdrawal fee differs by currency, but it is generally around ~$10 per withdrawal. Similarly to deposit, you can use only bank transfer. It is in line with the competitors. You can read that if you withdraw before the daily cut-off time, the money is sent instantly Than it is up to your bank when it arrives. We tested it and received money back in 2 business days. When you trade at TradeStation, web platform is provided by Interactive Brokers. You can choose between the normal and the beta Webtrader. In this review, we tested the normal version since the beta is permanently subject to testing and changes in functionality. The platform is available in many languages: English, German, Spanish, French, Italian, Dutch, Russian, Slovenian, Chinese and Japanese. This can be changed within the platform. The platform looks really complicated and indeed, it is not user-friendly at all. If you are a beginner, we definitely do not recommend starting with this. It is obvious that this is not the core product of IB, they are optimizing their efforts for the desktop version. The platform layout is highly customizable providing great flexibility in optimizing to your needs. The search function is awful. You can search for the preferred product in two panels, on the search panel or the product panel. On the search panel, you will hardly find what you looking for. For example, if you search for Amazon, you would expect to list Amazon on the NASDAQ at the first result. Instead, you will see German stock exchanges at the first places and Amazon in the middle. The product panel is also not convenient as you have to write the symbol of the products. Therefore, you only find Amazon if you write AMZN. You can set alerts and notifications, but it's not convenient at all. You have to log in the client portal where you have to set the alerts on the settings. We think that it would be much easier if you can set alerts on the platform and not on a separate page. Portfolio and fee reports are transparent at IB. You can see your performance on the Account tab. It clearly shows what is your historical profit/loss balance and how much costs you paid. 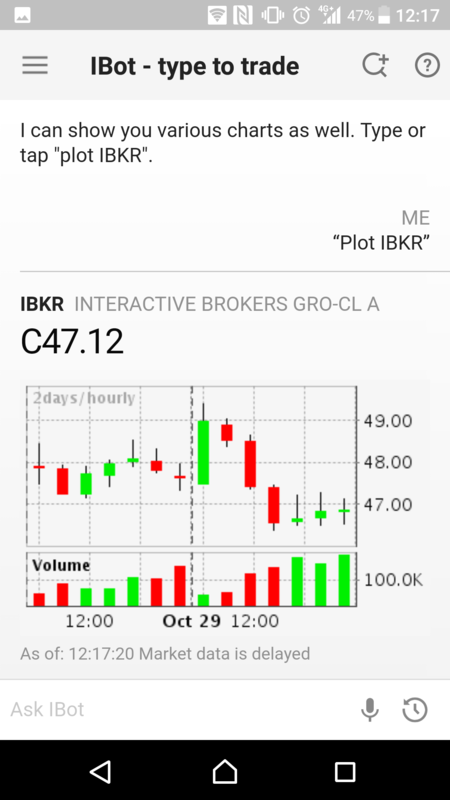 Similarly to the web platform, you can use only Interactive Brokers' mobile trading platform. It has a lot of functions, even a chatbot. On the other side, it could be more user-friendly. 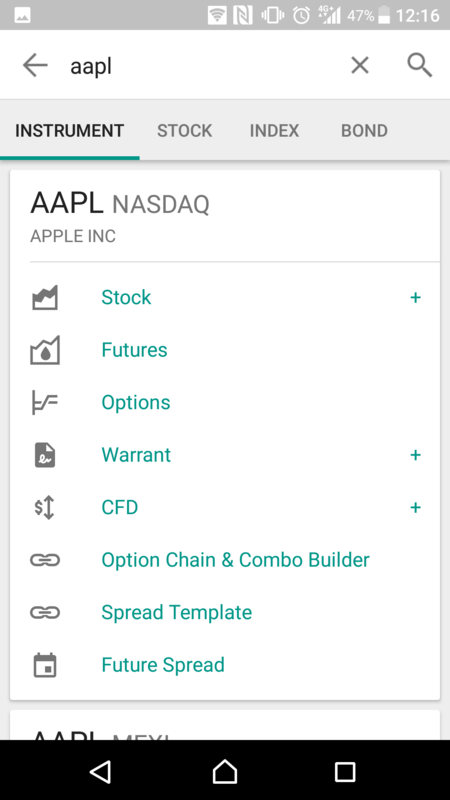 When you trade at TradeStation Global, the mobile platform is provided by Interactive Brokers. It is available both for IoS and Android. In this review, we tested on Android. The mobile trading app handier compared to the web platform. On the other hand, both its look and user-friendliness lag behind the competitor mobile platforms. 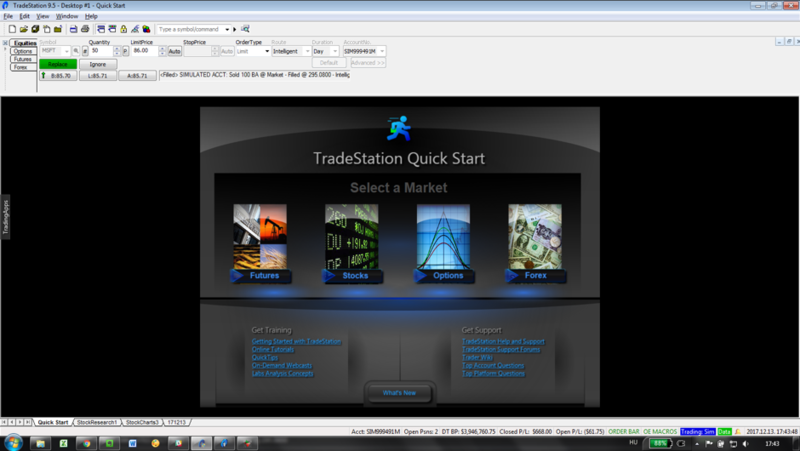 TradeStation Global desktop platform has a good customizability and order types. However, the platform is not user-friendly and it is hard to get a clear fee report. 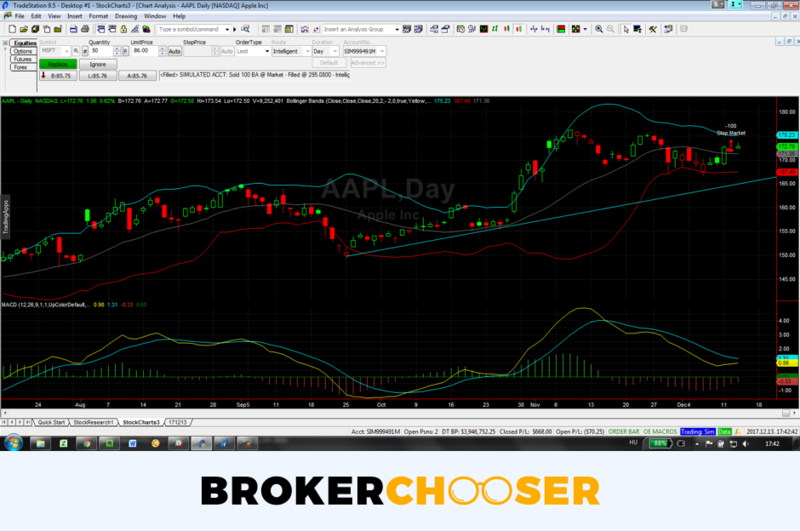 In this review, we tested TradeStation's platform and not the Interactive Brokers platform. The platform is only available in English. You can use TradeStation 9.5 and not the most recent TradeStation 10 which is only for TradeStation clients, and not for TradeStation Global clients. TradeStation 10 is much nicer than the old 9.5. TradeStation Global desktop trading platform suits daily traders, and professional traders. It can be customized well and has a wide range of tools. If you are a first-timer or long-term investor, you will struggle to use its features. It is not intuitive and has an outdated design. TradeStation Global scores very well on placing orders. There are a lot of order types, including very sophisticated ones, like the OSO or OCO. You can place orders in many ways. At the order bar, at the advanced order bar, through charts and you can also use a matrix visualisation. We were unable to figure out how to set price alerts. This is due to the application's complexity and old design. We could not find a way to download, access, or print a fee report or account statements. TradeStation Global offers products which are available at Interactive Brokers. It is great as IB has many-many products. TradeStation Global offers all product types from stocks to options. 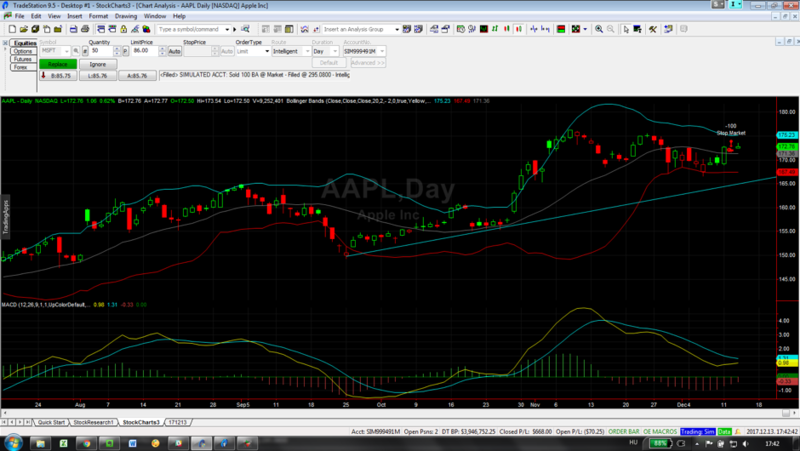 It also does a great job in markets you can access. Its stock, ETF, and bond coverage is exceptional. Only FX currency pairs and CFDs are not the highest. TradeStation Global will give you access to more stock markets than its competitors. This includes the major stock markets, like NYSE or LSE, but also minor ones, like the Polish or the Mexican markets. Also, a wide range of penny stocks are available. Beside stocks, you can trade with more than 20,000 ETFs. This is also a much deeper offer than other brokers. TradeStation Global provides more than 100 currency pairs. This offer is really wide, only the Saxo Bank can compete with it. DEGIRO does not offer forex. There ~200 fund provider which is great. You will find funds from the biggest fund providers like BlackRock or Vanguard and from smaller ones too. DEGIRO lags much behind it, while Saxo does not offer it. TradeStation Global gives you access to more than 100,000 bonds. You can see how deep this bond coverage is in comparison with Saxo and DEGIRO. The bonds cover both government and corporate bonds. Just like at the other products, TradeStation Global has an extremely good option offer. You will find the biggest option markets, like CBOE or CME, but you can also reach to the smaller markets, like Korea Stock Exchange or Mexican Derivatives Exchange. TradeStation Global performs well in future product offer as you can access to 36 markets. This is also more than the average at competitor brokers. Similarly to options, you will find both the major and minor markets. Unlike the other asset types, TradeStation Global has an average offer. You can only trade with stock and stock index CFD, and within these types the offer is mid-range. TradeStation Global research tools are mid-range. You can read quality news and use a good charting. However, there are no recommendations and there is only limited fundamental data. You can research both on TradeStation's platform or Interactive Broker's platform. There are different research tools available at each platform. In this review, we tested TradeStation platform's research tools. You will not be able to use TradeStation's market and fundamental data, but only IB's. There are only basic fundamental data, e.g. the company's foundation or P/E ratio. If you need more in-depth fundamental data, use Interactive Broker's research tools which are also available for TradeStation Global clients. We were satisfied with the chart function. You can use over 170 technical indicators and you can save the charts. 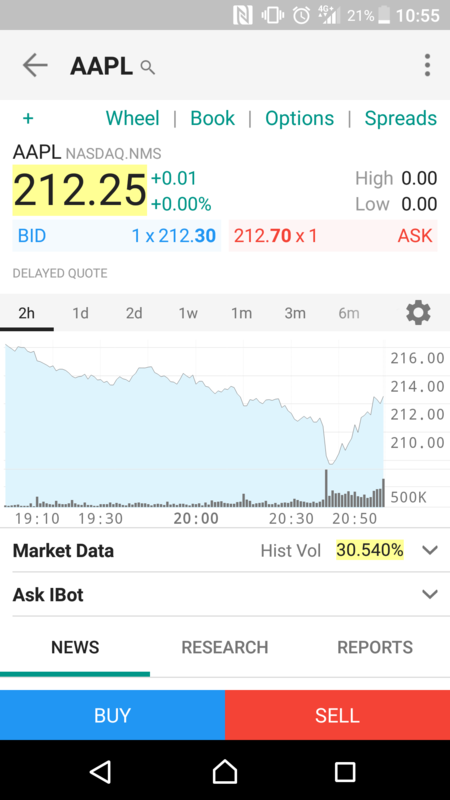 The chart trading function is also available. On the other hand, it is not user-friendly. Some function is a hard master. E.g. the zoom function works unlike any other app we tested. You will find news snippets. They are imported from news sites, and they are not written by TradeStation. You can view the news in product categorization. However, we found that there were often no news results for popular companies. E.g. we searched for big companies like Exxon Mobil, and Google, but there was no result. 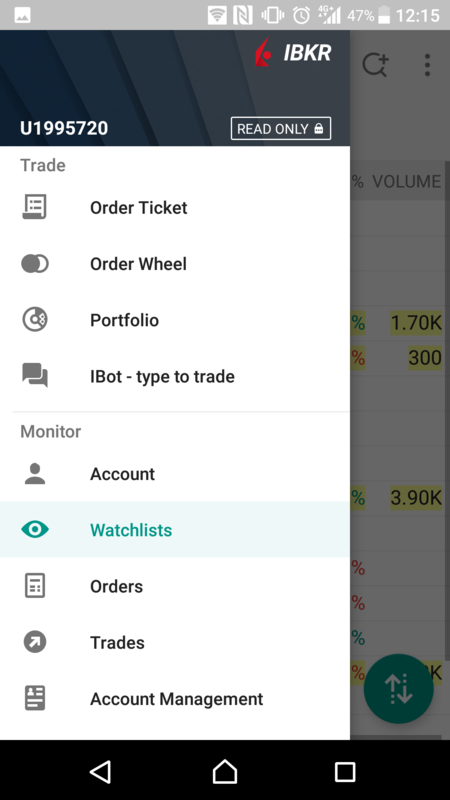 TradeStation has a great watchlist, called Radar Screen. You can customize it to infinity, using more than 300 data points and also checking charts. The EasyLanguage allows you to customize indicators if the 170 indicators would not be enough. TradeStation Global has a great telephone and email support. On the flip side, there is no live chat and you can't contact them during the weekends. TradeStation Global operates a customer service which you can contact. Additionally, you can also contact Interactive Brokers' customer service. We were satisfied with the phone support. The agent was connected within a minute and we got relevant answers. Email support is also great. We wrote altogether four letters and the replies were always fast, more times within an hour. Furthermore, the answers were helpful and contained all information. TradeStation Global does not offer education. TradeStation Global, the introducing broker is regulated by the top-tier FCA. You will be the client of Interactive Brokers. Both TradeStation's parent and IB are regulated by top tier regulators and are listed companies. TradeStation Global is the brand, it is provided by the UK TradeStation International Ltd., a subsidiary of TradeStation US. Is TradeStation Global safe? To be certain, it is best to check two things: how you are protected if something goes south and what the background of the broker is. TradeStation Global is an introducing broker of Interactive Brokers. Think like an agent. In case TradeStation Global defaults, your assets would be with Interactive Brokers. Interactive Brokers is regulated by the UK FCA. This matters because you get the UK investor protection amount, called FSCS. It is £50,000 per account. The provided amount is higher than most European investor protection schemes. You will get negative balance protection for CFDs through Interactive Brokers. TradeStation Global is the brand offered by TradeStation International Ltd. TradeStation International Ltd. is owned by TradeStation, a US broker, established in 1982. TradeStation International is around since 2004. It started to offer TradeStation Global in 2018. 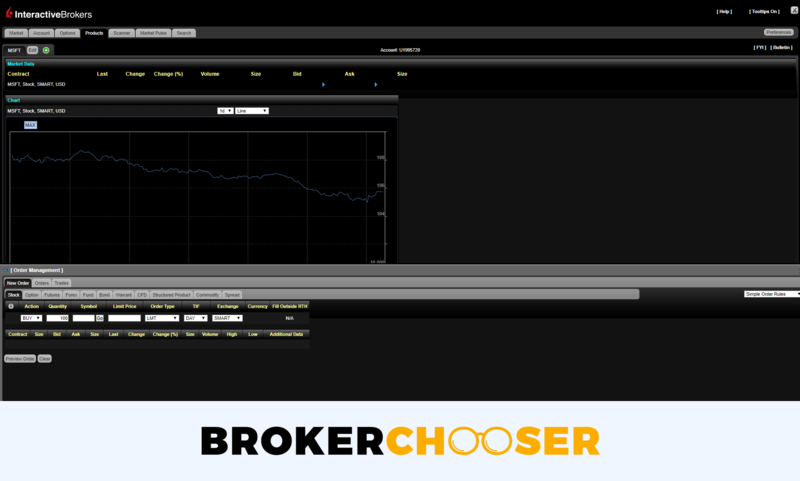 Interactive Brokers, which provides the service, is around since 1978. The longer the track record, the better. It means the company was able to manage financially through tough times. Both IB and TradeStation have long track records. Being regulated by the FCA and having strong parent companies are all great signs for TradeStation Global's safety.